St. Thomas’s Christmas Market, in one form or another, has been a fun and festive parish tradition for years. 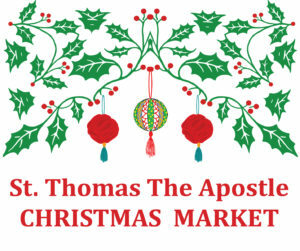 Who we are: We are St. Thomas the Apostle Parishioners with a special love for Christmas and in charge of planning, organizing, coordinating and hosting St. Thomas’ Christmas Market. Our Market specializes in one-of-a-kind finds, from handmade decor to spruce up your home to vintage treasures perfect for unique hostess gifts. raising funds for the St. Thomas the Apostle Building Fund. Requirements: Anyone is welcome. Because we want to raise as much money as we possibly can for the St. Thomas’ Building Fund, we really are running on volunteers and donations. Contact: For more information email us at stachristmasmarket@gmail.com.